That Sunday was cool and rainy with a Scottish mist rolling over the green hills of Tangle Creek Golf & Country Club. Never mind the dismal weather because all the action was indoors, where the Savour The Flavours Food and Drink Show was in full swing. Obviously, nobody told the golfers this because they teed off, one after the other, oblivious to the wet conditions. They can have their game. I will have mine! Warm and cozy inside the club house, live acoustic guitar music, good smells, a bustling crowd of eager munchers and friendly greeters were waiting at the reception desk. Now this is my kind of day at the golf course! Okay, beer is nice but where are the munchables? Ah there we go - Cross Wind Farm had some nice samples of aged cheddar to try. I took a small square on a toothpick and immediately realized that this was not the cheddar I was expecting. Cross Wind is a goat milk operation. Sometimes goat cheese is rather strong, at least to my palate, but this was not. Different yes, but not overbearing. 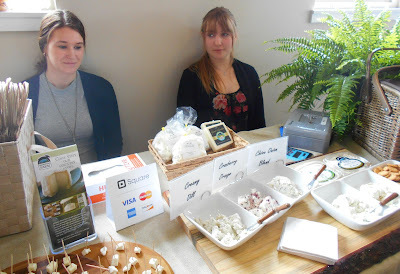 What I really enjoyed was their artisan chevre, which is a fluffy cream-cheese-like product available in many flavours. I tried the creamy dill - the fresh dill flavour sang out and once again, no strong goat taste. There were a number of barbecue vendors at Savour The Flavours and I managed to visit Momma Mari, or at least her friendly and enthusiastic son, Christopher Marinakos. This Orillia based family has been dabbling in dressings and sauces since 1974 and have products in all kinds of local shops and markets. I asked Christopher for a sample suited to my self described infantile (too many heat receptors!) palate and he suggested the Sweet Momma. Mmmm a lot like Diana Sauce. To which Christopher added "But better." 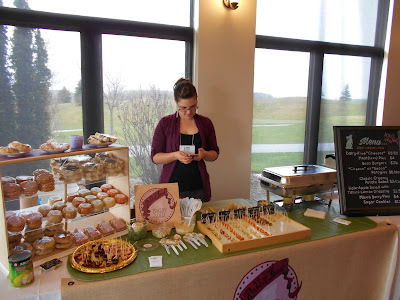 I spent a fair bit of time chatting with the lovely young lady behind the Rabbit Food Bakery & Deli table. I was very intrigued to find the term vegan (as all of her products are) combined with the word deli, which makes me picture a glass case full of sliced meats and various sausages. She had a colourful display of wonderful little nut cheezes with lots of flavours to sample. I tried sundried tomato and cranberry - so good! When I tracked down the boys again, I steered them over to Rabbit Food. I introduced them as my cavemen, (sorry, guys!) and encouraged them to give the vegan fare a go. They were particularly impressed with her potato salad with vegan mayonnaise and her cheeze sauce that goes great on nachos or burgers. Zing Zang is a well made and well named product. 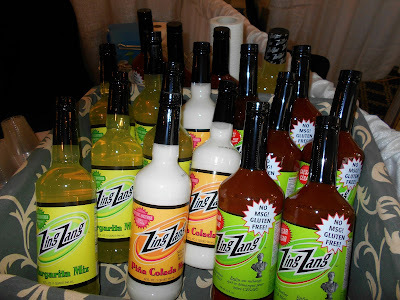 This company produces very flavourful drink mixes including caesar, margarita and pina colada and I can certainly see where the zing comes in. I was happy to try all three and I would say that all are fantastic. I could see my sister and I, and a bottle of that margarita mix, having a very nice little time beside her pool this summer. 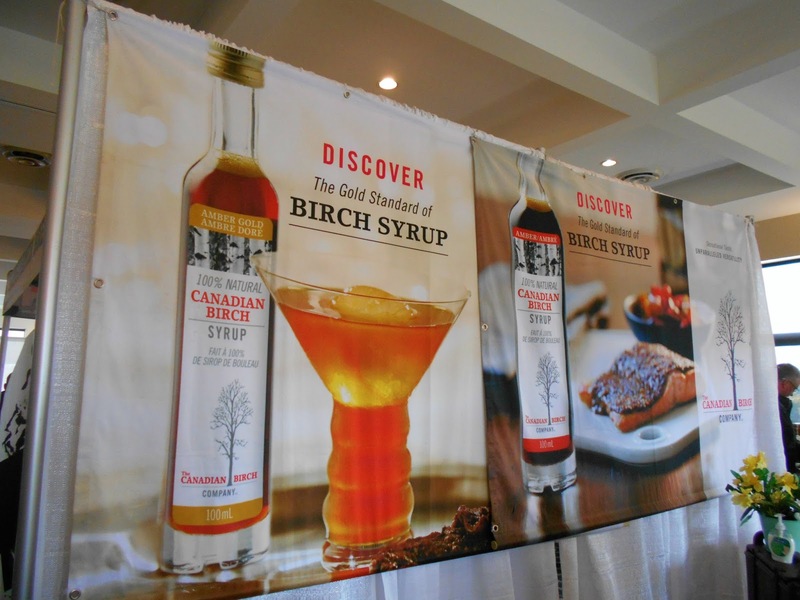 Birch syrup is going to be the next big thing. We all know about maple syrup but why should the maple get all the glory with so many other potentially tappable trees growing in our forests? Napoleon's chef, Don Cruickshank, had a small bottle of it beside his barbecue last year and that was the first time I had ever heard mention of it. 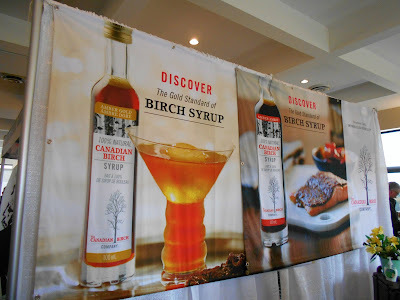 One year later, I found an entire booth dedicated to the educating, sampling and selling of birch syrup and its by-products. The Canadian Birch Company is leading the way with its Manitoba based business. 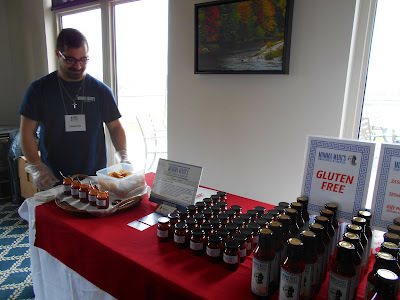 I am not much of a sweet tooth, but the syrup was good and I can imagine myself using it for some nice barbecued blackened salmon à la Chef Cruikshank. Such a crowd around Superior Meats! 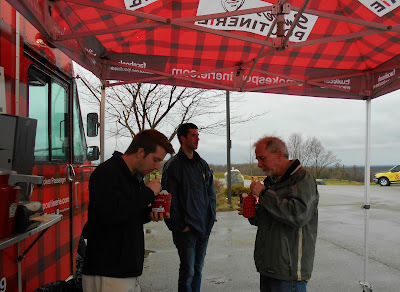 This company is not new and their products are available practically everywhere, but folks sure were keen to line up and try their samples. 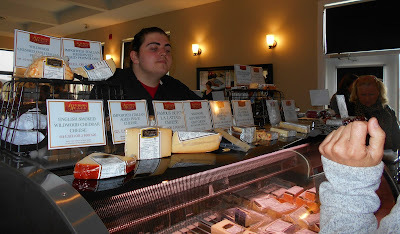 I considered passing by but a small card with the words English Smoked Wildwood Cheddar Cheese kept me firmly rooted in place until I got my reward - a small but flavour packed taste of cheese gold. Ripe Juicery has been in my favourite neighbourhood, Downtown Barrie, for a while now but I have not yet been in to visit. 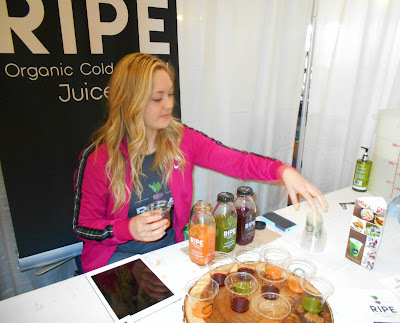 Lucky for me, Ripe had a tasting booth at the Savour The Flavours Show this year. Tiny cups of vibrantly coloured liquids were laid out on a wooden board. I just had to try them all. You will not believe this number, but 3 - 6 pounds of fresh produce go into every 500 ml bottle of Ripe juice! I sampled green (cucumber, kale, lemon, parsley, pineapple and romaine), then orange (mainly carrots and oranges) and lastly the brilliantly purple sweet beet. I have never liked beets, (too earthy for me), so this last drink was not my thing, which proves how authentically beety this fresh concoction really was. It was still drizzling away when we left. We decided to finish off our nibbling with a visit to Smoke's Poutinerie, one of several food trucks stationed outside the Tangle Creek clubhouse. Mmmmm fresh hot fries, cheese curds covered in steaming gravy on a cool day - why not?! And so all of the flavours of 2016 were well savoured. Definitely looking forward to what 2017 might bring!